Thank you for being here today to listen to my intervention and I hope that we will have a very fruitful discussion. My name is Mehrezia and I belong to the generation born just after the independence of Tunisia. I benefited from a modern Tunisia, the modern state founded by President Habib Bourguiba, from the rigorous public education system, a very progressive approach to women’s rights, and a world-class public healthcare system; it was also our generation that really hoped and worked for a better Tunisia; a state where it was possible not only to develop oneself socially and economically and to dream of a modern and democratic state, but to really make it possible. Since independence, Tunisia has become a modern state, yet, the principles of democracy, pluralism, peaceful alternation to power, and respect of human rights remained severely lacking. Tunisians have been demanding more democratization and greater freedoms from the 1970s. 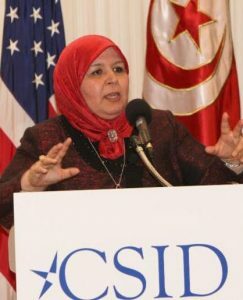 I am proud to say that one of the first voices in the struggle for democracy was a lady’s: Ms. Radhia Haddad, the founder of the Tunisian Women’s Union. She declared, in 1972, speaking directly to Bourguiba in the Tunisian parliament, that modernity itself was not enough: “we want modernity and democracy in this country; we deserve it, and we are worth it as Tunisians.” She was eventually expelled from parliament as a result of that speech. Some forty years later, after the 2011 revolution, we came into that same parliament building with the same dream and the same mission. It was high time for Tunisians to finally have a say in their government. For all Tunisians, human rights coincide with Islamic values, that Tunisian people shall reconcile with their history, their present, their traditions, and with their modernity; the dream was a big one. As I was among the members of parliament in the National Constituent Assembly that took office in November 2011, I had no doubt that my colleagues, the Tunisian civil society, and all members of political society wanted this democracy to become a reality. At that time, only a few months after the revolution, we were emerging out of a period of despotism, lack of freedom of expression and of assembly, and were not accustomed to a common space for constructive and free dialogue between us. Suddenly, we were writing a new social contract: a constitution that would enshrine the freedoms and liberties for which so many Tunisians had fought and died. Some dreamt of a democratic Tunisia that looked more distinctly Muslim than secular in identity, and others envisioned a Tunisia more secular than Islamic. Others still believed that the need for stability and security was of greater interest than freedom or democracy. Our responsibility was to put all these different visions together to be able to arrive at a common and shared social contract in our new constitution. This was not an easy task; we endured many periods of great difficulty. Our country experienced political and ideological polarization, as well as two political assassinations that sent our nation into disarray. We had people in the streets demonstrating for more Islam, others for more secularism; others demonstrated for more respect of identity while others emphasized the need for well-defined political and economic programs. We had very tough discussions within the National Constituent Assembly, civil society organizations, and on countless media platforms, but eventually, after two years’ time, we were able to transcend our differences and arrive at a compromise. How to put all these challenges together and yet keep on believing in our dream was our main target. We were also expected to address the expectations of our youth, particularly in disenfranchised regions like Kasserine and Sidi Bouzid who are expecting the revolution to bring them prosperity and development. Tunisia is a demographically united country: the majority of Tunisians are Sunni-Maliki, and with few ethnic or linguistic differences. We have, for example, a historic Jewish community in cities like Djerba, Gabes, Tunis, and Nabeul, and they have long been considered integral to the social fabric of the country. So, this homogeneity in the spheres of religion, language, and ethnicity was one factor for our success. The other factor is coming from the modern state built by Bourguiba. He stressed the importance of education; in Tunisia the percentage of literate and university educated people is quite high compared to other countries. Since we have an educated populace, we may have conflicts and differences of opinion regarding national projects or priorities, but we are equipped to handle them appropriately, peacefully, and without resorting to violence. The Tunisian people loathe and reject bloodshed and this is why when we were struck by terrorist attacks, we remained united against terrorism; indeed, we will never let violence reign in Tunisia. The other factor for success is that we have a strong civil society with a rich history; the Tunisian General Labor Union (known as UGTT) is the first trade union in the Arab World, and was founded by a real communist activist and one of the Sheikhs of Zitouna: Sheikh Fadhel Ben Achour, Mohammed Ali Hammi, and, later on, Farhat Hached. We have the one of the first leagues of Human Rights in the Arab World, strong women’s rights organizations, and an active lawyers’ unions, which was one of the first organizations that would challenge the Ben Ali regime. When the transition came to a very sharp crisis in July of 2013, our civil society refrained from engaging in the heightened polarization and chose instead to be a mediator, which is why the National Quartet was awarded the Noble Peace Price. We politicians are often criticized of privileging the narrow interests of political parties over those of the nation, and I would like to recognize two particular political leaders who, in this very sensitive period of transition, have chosen together to prioritize Tunisia over their own political parties: Rached Ghannouchi and Beji Qaied Essebsi. I want to pay tribute here to the President of the Republic Mr. Essebsi, elected to the presidency in 2014. He was the leader of the opposition from 2012 to 2013, after being one of the first prime ministers who led the country to the elections of the National Constituent Assembly. He had a remarkable capacity to mobilize many small political parties around him, and founded a large political party called Nidaa Tounes, which then came to challenge the governing Ennahdha party, the party to which I belong. Yet, at the apex of the national crisis, when even the parliament was split, he was able to convince his fellow party members to put aside partisanship and seek consensus. He launched this invitation, and the invitation was accepted by Sheikh Rached Ghannouchi, the president of Ennahdha and the leader of the governing coalition at that period. At that moment, many Tunisians and international observers were expecting an epic and contentious battle: who would exclude the other? But they surprised us all. In August of 2013, they announced a pact of reconciliation, a National Dialogue to replace deepening rifts with coalition-building and compromise. This dialogue was mediated by four civil society organizations: (1) the Tunisian General Labor Union, (2) the Tunisian Confederation of Industry, Trade, and Handicrafts, (3) the Tunisian Human Rights League, and (4) the Tunisian Lawyers’ Union. This visionary leadership contributed to the ongoing success of Tunisia’s democratic transition and allowed us to continue deliberations on the constitution and eventually to approve a constitution in a very pluralistic and constructive atmosphere. Out of the National Dialogue negotiations, we established a committee within the National Constituent Assembly called the Consensus Committee. While voting on the articles of the constitution, each time we had a problem, each time the vote could not reach a majority, we brought the issue to the Consensus Committee. What is important to note with this Consensus Committee was that it worked according to the principle of the greater good, not merely what was just or fair according to the rule of proportional representation. This is how we succeeded to vote shared social contract which is our constitution. What is particularly important, now when you ask women’s rights organizations, youth organizations, almost any political party their thoughts or position on the constitution, they will unanimously answer that it is a constitution that represents their interests and one to which they subscribe wholeheartedly. A feeling of ownership of the constitution is common between all Tunisians. This is also very important for the success of the Tunisian model. Yet, now, we are in a second transition in which we face a new kind of challenge: achieving lasting economic growth. A democracy that cannot deliver prosperity, jobs for the 31 percent of youth who are currently unemployed, infrastructure for the historically disenfranchised inner regions, and higher income opportunities for struggling families is a democracy that will soon face rising popular unrest. Honestly, if Tunisia succeeds in its economic transition and we are striving to do so, this means that democracy all over the world is the winner, not just in Tunisia. We organized a very successful international investment conference – Tunisia 2020 – in November of 2016, that brought great promise, and we are developing our capacities to achieve and implement these initiatives, but we still need the support of the international community for our nascent democracy. The second challenge currently facing our country is security. We endured great setbacks when terrorists attacked Tunisian society, Tunisian security forces, and Tunisian visitors and guests in Hammamet and Bardo in 2014 and 2015. Indeed, when it attacked our model of society, we did what we had to do as a population, as a civil society, as a government, and as members of parliament to send a powerful message that Tunisia would not succumb to fear or violence. In reality, the threat of terrorism is an international one, and one that is unfortunately quite imminent for our region of the world. Next door, Libya has become fertile ground for some very violent groups and activities. On the other hand, Algeria has been a great ally in our fight against terrorism, and Tunisia owes a a large debt of gratitude to our neighbor and partner Algeria for its continued support. The international community at large has also been providing material and technical support to Tunisia in facing this phenomenon. Yet, there is an open wound that remains in Tunisia as the terrorist networks have succeeded in attracting and recruiting a considerable number of our youth, an undeniable fact that necessitates a multi-pronged approach. On the level of the Presidency and the government, we are working now to develop a comprehensive strategy to face terrorism and to address the root causes of this phenomenon to prevent it and to heal and to remedy its impacts on our society. I will leave you with one final remark: On March 7, 2016, a group of terrorists entered through the Libyan borders to the city of Ben Guerdan, a city which had not yet seen the promises of democracy translated in reality. Yet, they have benefited from freedom, democracy, and full citizenship rights. In spite of their grievances with successive Tunisian governments, they faced the terrorists head-on and they helped the security forces to round them up and chase them out of the city. They sent a strong message that ours may be struggling democracy, but an unfinished democracy in any case is preferable to violence and chaos. They have sent a message to youth all over the Arab and Muslim world that the path to a better future begins at the individual and local level. When we are capable of transcending our difficulties, differences, quarrels, while giving priority to the nation, to this country, to Tunisia; everything is possible. After achieving economic development and transition, being winner on terrorism, guaranteeing stability and security: we will be able to do all this as long as we stay united. After a long period of doubt and expectations, Parliament recently signed a law that will allow us to have local elections, to bring participatory democratic processes from the national level to the local one. This, for me, is the real revolution because it will give power to the people to provide local solutions to local problems, and will give us yet another path to continue building our nascent and burgeoning democracy. Tunisian democracy is fragile but we Tunisians, whether we belong to this or that party, young or old, we still have the same dream. We want to build a democracy where diversity, human rights are respected, where the alternation to power is not done through coup d’état but through elections. We insist on building a democratic republic based on citizenship, supremacy of the law, and sovereignty of the people, while reconciling Islam, democracy, and modernity, once and for all. Tunisia is ripe for success and will continue down this path. I invite you all to visit Tunisia and witness our accomplishments firsthand.